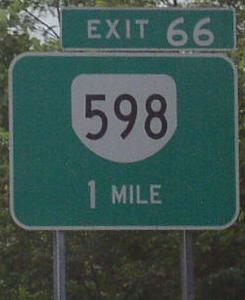 Virginia State Route 598 is a east-west highway in the north portion of Bland County. This highway runs along the Virginia/West Virginia State Line, near Bluefield. VA St Rt 598 does not pass through any town in Bland County. VA St Rt 598 is not multi-plexed inBalnd County. VA St Rt 598 intersects the following highways in Bland County. U.S. Rt. 460, near Bluefield. Interstate 77, near Rocky Gap. U.S. Rt. 52, near Rocky Gap.